The fireworks are just beginning on the ABC hit “Boston Legal,” as producer extraordinaire, David E. Kelly, blasts holes in the cast, making major changes. “We’re coming back next year, and I’m ecstatic about that,” James Spader admitted. Spader and William Shatner, of course, are safe, but gone is the legally blonde duo of Julie Bowen and Mark Valley. Also out are Rene Auberjonois and Constance Zimmer, but a “Boston Legal” insider told us not to be surprised if either of them resurfaces again. John Larroquette, who became famous on "Night Court," will now share the court with the quirky Boston partners. But Larroquette will not be reprising his Emmy-winning role from “The Practice.” Instead, he'll play an attorney from the New York offices of Crane, Poole and Schmidt. Kelly also revealed some other secrets from next season: Alan will rekindle an old flame, Denny will meet a new challenger and someone from Shirley’s past will come back into her life. 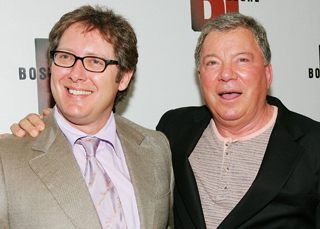 And while we're breaking “Boston Legal” news, let's clear up the long-standing rumor that Shatner and producer David E. Kelly have never actually met.